One in an occasional series in which FOW publishes articles that appeared in our publications in the past, and still resonate with us today. This piece was written by Anne M. Brennan, former Horticulture Section Leader at Bloomfield Farm, Morris Arboretum, and appeared in FOW’s Winter 2006 newsletter. Anne is currently the Gardens Manager for the Ambler Arboretum of Temple University. She oversees the horticultural aspects of the campus’ plant collections, helps plan educational events, and teaches a course in Landscape Management within the Horticulture degree program. “Walking in a winter wonderland” might suggest snowflakes and sleigh bells to some folks, but another kind of beauty awaits us this season along the trails of the Wissahickon. During the winter, we can see the woodland understory in a whole new light – literally – as the sun’s low angle illuminates the creek and surrounding valley through the leafless canopy. Towering treetops that are obscured from view in summer are now visible high above. All around us, winter affords a perfect opportunity to observe bark, buds, reassuring pockets of green, and even a few flowers. On a recent walk along the Thomas Mill Ravine trail, I stopped to admire the plush, vivid-green mosses that covered several fallen trees and stumps. Occasional clumps of native evergreen ferns, such as Christmas fern (Polystichum acrostichoides), punctuated the rocky trailside slopes. Such plants are most visible now due to increased light penetration and a contrasting backdrop of fallen leaves. 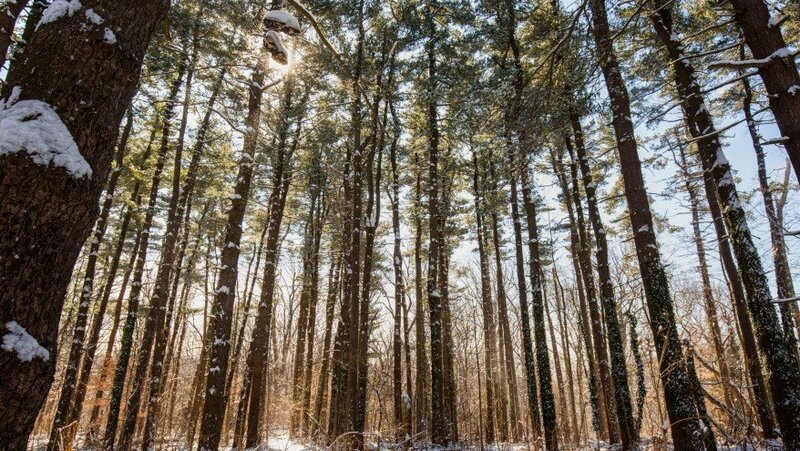 Look up, and you’ll find that the tree canopy is filled with texture during the winter. Summer’s nearly uninterrupted ceiling of green gives way to a variety of surfaces and forms once the leaves fall. Most notably, the smooth bark of American beech (Fagus grandifolia) contrasts with the rough and scaly bark of sugar maple (Acer saccharum), silver maple (Acer saccharinum), and many of the hickories (Carya spp.). Beech and oak (Quercus spp.) retain their crisp leaves well into winter, releasing them gradually during periods of wind, rain, and snow. The tallest trees I observed during my woodland walk were invariably tulip-poplars (Liriodendron tulipifera) with their distinctive, angular branching pattern and absence of lower limbs. In summer, these giants appear as thick, straight poles disappearing into the canopy; only in winter can we look to the tops of these trees and appreciate their stature. In just a few weeks, the silver maples will be the first woodland trees to flower in late February. Most often growing in wet soils, this species offers an early promise of spring when its buds become clearly visible by December. As winter steps aside in March, red maples (Acer rubrum) flower next, with their tiny pinkish-red inflorescences creating quite a show. On a “bittersweet” note, winter is also a good time to observe some of the invasive plant species that have established themselves in the Wissahickon and elsewhere throughout our region. 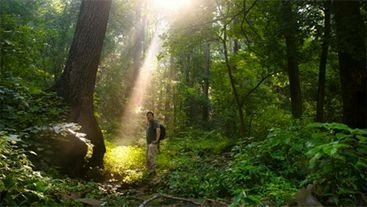 Thanks to the ongoing work of volunteers, however, observations of invasive species along the Wissahickon’s trails are the exception rather than the rule. Bush honeysuckle (Lonicera spp.) in the understory is easy to recognize now due to its arching branches, sinewy bark, and leaves that remain yellowish-green into the winter months. These fast-growing shrubs form impenetrable thickets, especially along stream banks, in neighboring woodlands where they are not continually controlled. Burning bush (Euonymous alatus) is another invasive woodland shrub that can be identified readily in winter, due to its distinctive winged stems. Oriental bittersweet (Celastrus orbiculatus) is a common invasive twining vine in our region, though I am happy to report that I have not personally observed it during my recent Wissahickon walks. It has, however, posed a challenge here in the floodplain at the Morris Arboretum. English ivy (Hedera helix) also makes an appearance along the park’s Thomas Mill Ravine trail, but I admit that I welcome its glimmer of deep green in the winter landscape! While this season of short days can seem drab and unchanging at times, a quiet winter walk in the Wissahickon every few weeks will change your mind. We may occasionally fail to “see the forest for the trees” in the figurative sense, but we find a wonderland of detail and variety as we observe the trees and other plants in our park this winter.